The worrying scenario grows closer. 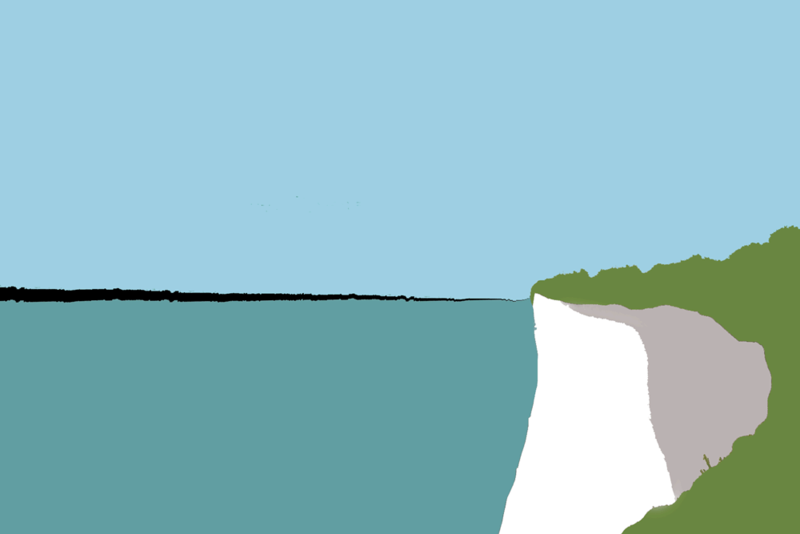 It’s Cliff Brexit, careening off the white cliffs of Dover on his way to destroy his own country by the act of his suicide. Don’t go over the Brexit cliff, Cliff! But he is not listening. He has a job and a plan and he’s going to get there come hell or high water. How far down is it to the bottom of the cliffs? He hasn’t got a chance. Perhaps a little back-story for those who aren’t quite up to speed on all the nuances of “Cliff’s” Brexit? On Thursday, 23 June 2016 the United Kingdom held a referendum on whether to leave the European Union. There were arguments both ways at the time – on whether it was a good or a bad thing for Britain. And of course, the UK voted to leave. There were then things that needed to happen in order for the ‘will of the people as shown in a referendum’ to be translated into legislation. One of these was Article 50 of the Treaty of Lisbon – and while there was no pressure on the UK to trigger Article 50, the UK Government did – on Wednesday 29 March 2017, giving the UK two years to negotiate the terms of its exit from the EU. It is generally accepted that the UK could withdraw its ‘resignation’ and remain in the EU – if it does so before the 29 march 2019. It could even be a later date if the parties agree to extend the date so that negotiations could continue. A lot of of the forecasts made in the lead-up to the referendum – forecasts both by those in favour of leaving and those in favour of remaining – were claimed by their opponents to be inaccurate. Now, it is two years down the line from the triggering of Article 50, and the damaging consequences of leaving are clearer. So my characterisation of those who refuse to look at the increasingly clear realities is embodied in the personage of Cliff Brexit – a person bent on walking over the cliff, come what may. Pride. The inability to admit one has made a mistake. Yes. Unfortunately, this is a fall that takes everyone else with it. As you said, all is not lost, there is still time for intelligent thought to triumph over ego. So, don’t stop pushing people to think, hey?